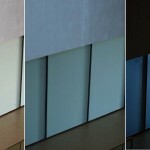 Switchable Privacy Glass is a unique solution for education providers who are seeking to provide research opportunities into electronic smartglass. We supplied the University of Technology Sydney with four large Switchable Privacy Glass panels, each measuring 3000mm x 1280mm. Our Privacy Glass is supporting students in their research into the science and operation of electro-chromic glass technology. While the bus bars are usually concealed within a panel’s framing, they were left exposed in these panels to assist with the educational experience. There are many exciting ways Switchable Privacy Glass can be incorporated into education settings to create unique and innovative learning experiences.